In Northern China, all work is underway on the construction of the Menghua railway | All about CHINA. The laying work of the Menghua railway, designed to transport coal from North to South China, began. Before the start of the train is still far away, at this time, construction crews started track laying works on the highway. Along the length of this railway line 1837 km, it will allow coal from the station Haolebaoji, which is located in the Inner Mongolia area to deliver to the city of Jian in the Eastern part of China.The railway will pass through six provinces, until the completion of construction works for at least another couple of years. The launch of the highway is planned for 2020. On this road from the quarry in the North will carry up to 200 million tons of coal to the South every year. Coal, and now China is bringing in by rail, but with the start of the highway, Manhua volumes transported by railway of coal will increase considerably. Previously, the most grandiose railway route was put into operation in 1992 and it is called Datong. 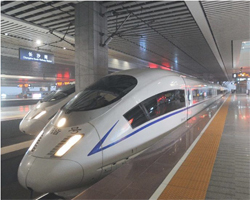 The railway connecting Inner Mongolia with the rest of China will allow to deliver minerals in processing plant. The district will receive an additional incentive to develop the extractive industry. Since 2020, China`s interior will be better equipped with energy resources, which will be delivered from the North of the country.